Recorded on November 16, 2006 in Berlin by Nikolaus Neuser. Cover design by Carlos Santos. “Put aside any conventional concept of sonic beauty when listening to this provocative horn-plus-percussion CD. As a matter of fact, tolerance for sonic brutality might be a quality to bring to the disc – along with an appreciation for the unexpected. Noisy, clamorous and blaring are the adjectives that are best attributed to this dual German duet, although just like no two snowflakes are the same, no two harsh noises are indistinguishable either. 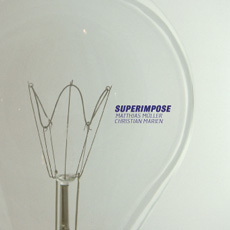 On Superimpose the players are trombonist Matthias Müller and drummer Christian Marien on a diabolical busman’s holiday from their regular gigs. Both are members of the jokey and jolly Olaf Ton band; the drummer also collaborates with dancers, hip-hoppers and performance artists; the trombonist is also involved with avant-garde theatre and dance groups and teaches trombone in Dresden. […] Only slightly less clangorous, Superimpose’s six tracks may sound the way they do because Müller’s subterranean plunger work, braying tones and throat rumbles can’t replicate the continuous piercing shrillness of a reed. But that’s not for lack of trying. Still in mid-range his wide bell space and tongue manipulation allows the absolute sound of air currents and chromatic note clusters to be heard. For his part, Marien doesn’t take a back seat to Schliemann when it comes to cacophony. Little ruffling or nerve beats are on display when the percussionist can repeatedly rattle what seems to be an aluminum pie plate; trigger the equivalent of single revolver blasts with a pointed drumstick; or produce seamless, reverberations to break up the beat from floor toms and snare; plus create sputtering and hissing decorations from the cymbals. Tightrope walking on the divide between noise and non-noise, this duo create notable provocative sounds. The point where they can be admired as much as accepted depends on the listeners’ adventurousness.